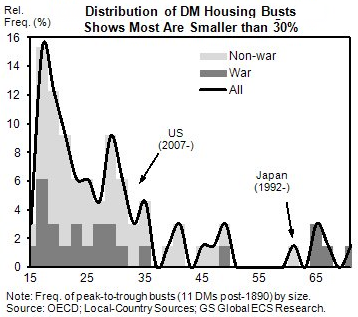 Goldman recently completed a thorough study on housing busts around the world and throughout history. The study covered the time period since 1890 for some dozen "developed" economies (including for example the US housing bust of the 1920s). 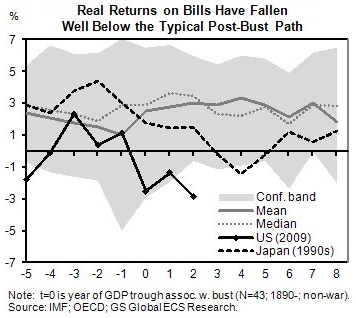 The idea was to assemble statistics on the pre and post-bust economic trends. That in turn allowed them to gauge what was or was not typical about the US 2007 housing bust. Based on these findings, it turns out that in general the US housing bust was severe but not that unusual. The chart below shows the historical distribution of housing market corrections for all the nations and periods included in the study. The 30-35% correction in the US housing market (as scary as the experience has been) is not outside the range of other housing busts (DM refers to developed economies). 1. 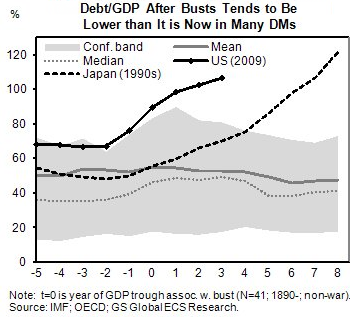 The US public sector leverage increase is sharper than the historical range. 2. As discussed before, the level of real interest rates in the US is completely outside the historical range. Other indicators for the 2007 housing bust are roughly within the historical range for such events.